I love old candid photos. Maybe that’s because so many tend to be posed and stiff. 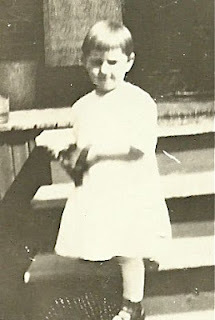 Although a bit out of focus, this one captures my grandmother’s shy smile. I’m estimating she was nearly 5 years old here. Why was she the subject of attention that day? Was it September 23rd, her birthday? Or was it, as I suspect, her first day of school? Either one might explain why the adults are in the background, rather than with her in the picture. Too bad the photographer cut their heads off, though! Looking at the very small version of this photograph in blogger I thought how much your grandmother looked like photos I have of my mother. As I read your post I realized that they were about the same age. My mom was born in 1915 and wore a similar white dress in one of her photos. 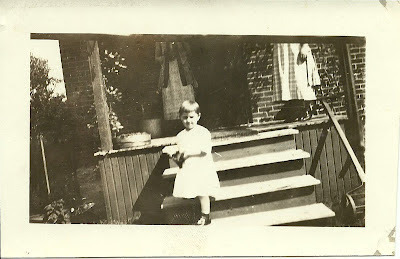 Your grandmother is adorable and it IS too bad the photographer cut off the heads of the ladies on the porch. Wouldn't you love to know who they were and what they looked like?! Yes, absolutely, Nancy! That's interesting to hear about the similarities in the photos. My grandma was born in 1916. Her parents were not well off, which is one reason I think this picture must have been taken on a special occasion. And the foliage on the trees looks like late summer to me. Did your mom grow up in Columbus too? Was her picture taken for a particular event?